Opening Friday, Oct. 2, is Michael Moore's latest satiric documentary, Capitalism: A Love Story, this time dealing with the current economic crisis. Moore says it's a crime story, a class warfare story and a comedy. Rated R for some language. 120m. At Broadway and Minor. Drew Barrymore's directing debut, Whip It, features Ellen Page as a teen who dumps beauty pageants to pursue roller derby, much to her mother's chagrin. Looks promising. Rated PG-13 for sexual content including crude dialogue, language and drug material. 111m. At Broadway. The Invention of Lying is a comedy directed by and starring Ricky Gervais and Jennifer Garner about a man living in a world where no one has ever lied. He tells the first, and goodbye Garden of Eden. Rated PG-13 for language including some sexual material and a drug reference. 100m. At Broadway. The comic horror film Zombieland stars Jesse Eisenberg and Woody Harrelson in a future world where zombies dominate. How to deal -- kill, or integrate? Guess which is more fun. Rated R for horror violence/gore and language. 81m. At Broadway, Fortuna, Mill Creek and Minor. Toy Story and Toy Story 2 will run as a double feature in 3-D at Broadway and Fortuna. The films are rated G and the total running time is about 173m. 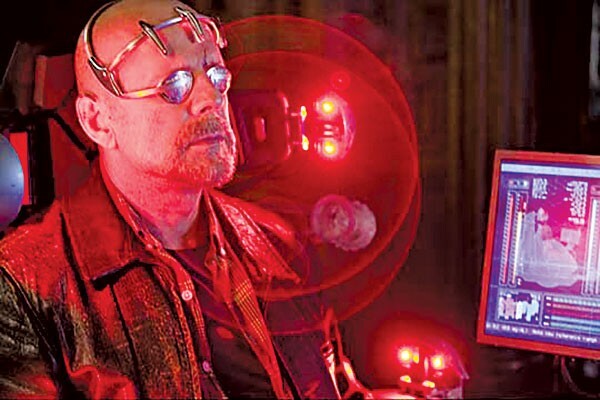 SURROGATES: Based on the comics of the same title, Surrogates is set in 2017, when humans mostly never leave their houses because their electronically connected surrogates live their lives for them. Since anything that may happen to the surrogate is not transferred to the wired owner, everyone is safe in his/her computer-controlled cocoon, or so they are led to believe by the corporation that markets the surrogates. But when a virus disables the firewall between human and surrogate, humans begin to die as their surrogates are destroyed. Such is the premise of this film. Glacially paced, the film seems twice as long as its modest hour-and-a-half running time, and somehow the avatars all resemble Barbie and Ken dolls, with the attendant range of expression and emotion. Brave new world environments are often depicted as bland, so I guess I shouldn't nitpick about that, but thank goodness for the malcontent humans called Dreads led by the Prophet (Ving Rhames) who live on reservations (I'm not making this up) and envision returning to a world without surrogates. In fact, they might be behind the spate of murders that threaten the surrogate world. And so enters our intrepid hero, F.B.I. Agent Greer (Bruce Willis) as a Ken doll with a Willis smirk, and his partner Peters (a waste of Radha Mitchell's talent). We discover early that Greer is unhappy with his surrogate life and wants his wife Maggie (Rosamund Pike) to shed her glamorized avatar and go off to Hawaii on a human vacation. Happily, Greer's avatar is destroyed early on while chasing a human who has the weapon that is responsible for the murders, so we get the "real" Willis for most of the film. He may not be a great actor, but he is reliable. The film's premise is interesting and there are the requisite plot twists, but its fatal weakness is that the film itself is tedious. Take off your watch to avoid constant distraction while trying to watch the film and just imagine that it's almost over. Rated PG-13 for intense sequences of violence, disturbing images, language, sexuality and a drug-related scene. 88m. At Broadway, Mill Creek and Fortuna. IN THE LOOP: Based on a BBC TV series I have never seen called The Thick of It, In the Loop is a quintessential British satire on the theme of contemporary Anglo/American politics. I imagine the film will polarize viewers, but those who enjoy the typical verbal satire that characterizes British political comedy will surely enjoy the film. There is a plot. It seems the British P.M. and the American President want to invade a Middle Eastern country, but need to find intel that justifies the war. They get a break when British minister Simon Foster (Tom Hollander in a wonderfully understated performance) says that war is "unforeseeable" in an interview, a comment that may be interpreted as contrary to the official line. Among the other sharply drawn characters are U.S. assistant secretary Karen Clarke (Mimi Kennedy), a dove, and her former lover General George Miller (James Gandolfini), also a dove, along with newbie British political advisor Toby (Chris Addison) and Clarke's assistant Liza (Anna Chlumsky), college sweethearts who renew their vows, so to speak. The film is a wonderfully jaded depiction of power politics, where almost everyone is jockeying for position in an underhanded manner. While this is not exactly a stretch, the film carries it off with panache and trenchant humor. If you enjoy British comedy and political satire, don't miss it. Not rated (but would be an R for language). 106m. FAME: Performance films have been a popular film genre since the advent of sound, as the success of the Busby Berkeley and Fred Astaire films in the 1930s demonstrated. The original Fame was released in 1980 and subsequently became a stage musical and a TV series. It is, of course, the high school sub-genre musical now following in the footsteps of the High School Musical films and many other iterations. The new Fame hits all of the genre marks, paying tribute to the original while creating new storylines. Fans of the genre, though, aren't looking for films that break the conventions. What powers these films is the talent of the young performers, and this Fame has that in spades. As with the 1980 version, the film encapsulates four years at a performing arts high school in Manhattan by focusing on several students representing the disciplines of music, dance and theatre as they move from exciting promise in their freshman year to the inevitable heartbreaks and successes of their senior year. The central characters include the always happy singer Marco (Asher Book), the intellectualizing theatre student Jenny (Kay Panabaker) who becomes his girlfriend, classical pianist Denise (a marvelous Naturi Naughton, Li'l Kim in Notorious) who wants to sing despite her father's disapproval, and gorgeous, haughty dancer Alice (Kherington Payne, a So You Think You Can Dance contestant), along with their teachers (including Bebe Neuwirth and Charles S. Dutton). As someone who taught theatre for 30-some years, I was sorry to see that discipline somewhat marginalized, but then it's not as flashy as dance and music. The music sequences were very good, but for me the dancers stole the show here. Fame is more flash than substance, but at least the flash is nicely presented. I mean, what's not to like about watching high energy, talented young performers do their thing; their personal lives just provide the bridges between numbers. Rated PG for thematic material including teen drinking, a sexual situation and language. 107m. At Broadway, Mill Creek and Fortuna. 9. In a post-apocalyptic world, a group of like beings band together to take on the machines intent on their extinction. Rated PG-13. 79m. At Broadway, Mill Creek. ALL ABOUT STEVE. Sandra Bullock makes crosswords for a living and is set up on a blind date with cameraman Thomas Haden Church. Hilarity ensues. Rated PG-13. 99m. At the Movies. CLOUDY WITH A CHANCE OF MEATBALLS. Based on the beloved children's book wherein it rains food. The cure for the recession? Rated PG. 90m. At Broadway, Fortuna and Mill Creek. INFORMANT! Matt Damon plays a whistleblower who exposes his company's price-fixing scheme to the FBI. Rated R. 108m. At Broadway and Mill Creek. THE FINAL DESTINATION. Nick has a premonition and predicts the killing of his friends. Then teens die. Surprise! Rated R. 81m. At Fortuna. GAMER. Entertainment evolves to include gory, real, live human gaming. Throw out your Xbox. Rated R. 95m. At the Movies. G-FORCE. Government-trained guinea pigs out to save the world. With the voices of Nicolas Cage and Penelope Cruz. Rated PG. 90m. At the Movies. THE HANGOVER. Getting severely trashed with your bros at a Vegas-based bachelor party can have serious consequences, especially when no one remembers what happened. Wow, this is still in theaters! Rated R. 100m. At The Movies. ICE AGE: DAWN OF THE DINOSAURS. The gang makes a rescue mission for Sid that takes them into a mysterious underground world where they have close encounters with dinos and generally run amok. Rated PG. 87 m. At The Movies. INGLOURIOUS BASTERDS. A special unit of Jewish-American soldiers is sent behind enemy lines to spread shock and awe among German troops in Nazi-occupied France in Quentin Tarantino's latest film. 153m. At Broadway. JENNIFER'S BODY. Megan Fox stars as a demon-possessed high-schooler with an insatiable appetite. Rated R. 103m. At the Movies. LOVE HAPPENS. Jennifer Aniston and Aaron Eckhart jump on the romantic comedy train. Rated PG-13. 109m. At Fortuna, Mill Creek and the Movies. PANDORUM. Astronauts awaken on their spaceship unsure of their whereabouts and mission but become aware of a deep rumbling emanating from somewhere aboard. Rated R. 106m. At Broadway and Mill Creek. PONYO. "The Little Mermaid" through the lens of Japanese animation Rated G. 103m. At the Movies.